B & S Iron Works were located at 40 Wyckoff Ave., Brooklyn, from 1953 into the 1980s. The B in B&S was Bernhard Brandes (1880-1959?) and the S was Ferdinand Sbaschnig (1905-1970). Bernhard Brandes' naturalization petition, filed 21 Feb. 1927, states that he was born 8 Nov. 1880 in Czernowitz, Austria, that he emigrated from Le Havre, France, 20 Jan. 1921, and that he arrived in New York 31 Jan. 1921 on the vessel La Lorraine. The Brandes family is found in the 1930 U. S. Census living at 8003 Cowles Court, Queens. Brandes' country of birth is given as Romania. Czernowitz (now (2014) Chernivtsi, Ukraine) is near the Romanian border, and was part of the Austrian Empire until the end of the First World War. Bernhard Brandes is also found in the 1940 U. S. Census, when he lived at 6422 84th Place, Queens. Brandes was 60 years old and his occupation was "Proprietor, Iron Foundry." In 1942 Brandes registered for the World War II draft when he was 61 years old, born 8 Nov. 1880, "Czernowitz, Romania (Austria)." He gave his place of employment as "B & S Iron Works, 575 Hart St., Brooklyn, NY." 575 Hart St., Brooklyn, was an earlier address of B & S Iron Works. The Brooklyn telephone directory listed them at this address from 1929 through 1952. Ferdinand Sbaschnig is found in the 1940 U. S. Census, age 34, born Germany, living at 8423 72nd Ave., Glendale, Queens. His occupation was recorded as "Iron Worker, Fire Escapes." The Bartell Juran Family Tree on Ancestry.com gives Sbaschnig's birth date as "28 May 1905, in Masern, Gottschee, Yugoslavia." In 1953 the Brooklyn Daily Eagle reported, "Ferdinand Sbaschnig and Carl Diemer purchased from Martha Lechner the two-story factory at 40-42 Wyckoff Ave., on a plot 50x86, assessed at $88,500." 40-42 Wyckoff Ave. had been the location of Fred Lechner Co. This ad for Fred Lechner Co. appeared in the Brooklyn Daily Eagle in 1925. Numerous other B & S Iron Works knobs are found on sidewalk basement doors in New York. This one, for instance, is located on East 14th St. This one is located on Broadway near 18th St. 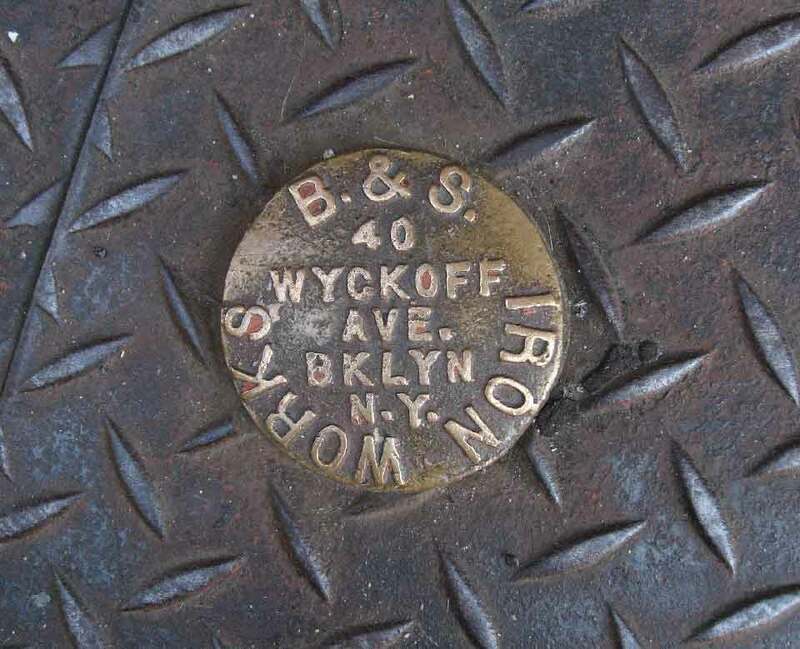 This one is inscribed 575 Hart St Bklyn, which was their address before moving to Wyckoff Ave.
B & S Iron Works seems also to have been called Base Iron Works, as evidenced by this knob at 361 W. 21st St. The website Business Lookup says that their New York State corporation filing date was 30 Sept. 1966 and that they were inactive through dissolution 20 March 1992.